As part of the ‘Digging Deeper into Watershed Soils’ project local landholders had the opportunity to explore soil health issues within our region at a series of workshops held last week. Watershed Landcare invited David Hardwick, Agricultural Ecologist and soil guru, to provide his expertise on some common erosion issues, their causes and solutions, and to provide participants with an understanding of how to implement these solutions and improve the soil health on their own patch. The workshops focused on improving soil health, the aspects which influence it, and adapting management decisions as a result of understanding the landscape. One of the properties visited was Karrabool Olives where the owners, David Sargeant and Judy Rogers, wanted to repair erosion and degraded soil in their olive grove. They also wanted David’s insights into how to improve soil fertility for the olives. The olive grove was planted on the side of a hill, with rows down, rather than across, slope. The top of the hill is poor, gravely soil and supports only some scraggly native vegetation. Runoff is causing sheet and rill erosion through the olive grove. David’s suggestions included a number of measures to slow the flow of water at the top of the hill. These included putting in a rip line along the fence at the top, allowing the native vegetation to re-establish and utilising olive prunings as a physical barrier to further slow the flow of water at the top of the hill. Dissipating the water in the olive grove was also an important consideration and the field day participants got their hands dirty, learning how to construct small rock structures to slow and fan out the water flow along the rows of olives. A soil pit dug to look at the soil structure in the olive grove indicated a layer of compacted soil. As a long-term management strategy to improve water infiltration and fertility and reduce compaction, David recommended widening the inter-row vegetation to reduce the bare area under the trees and increasing the diversity, particularly with deeper rooted species as olives have shallow roots. The tactics suggested by David are easy and relatively low cost options that David and Judy can implement before the problem got much more serious. Addressing issues early, or even preventing them when possible, results in manageable solutions. Over time small problems grow and when we are seeing the site everyday it can be easy to not notice the damage that is occurring. Monitoring of your land is the best way to stay on top off changes in your landscape and help you decide when its time to make a change in the way you mange an issue or erosion site. This project is supported by Watershed Landcare through funding from Landcare Australia and the Jaramas Foundation. Ever wondered what your cat gets up when you’re not looking? What if you could keep track of your cat’s whereabouts even when you’re not around? Now is your chance to get a unique insight into your cat’s habits. Central Tablelands Local Land Services and Mid-Western Regional Council invites you to take part in the Domestic Cat Tracking project. 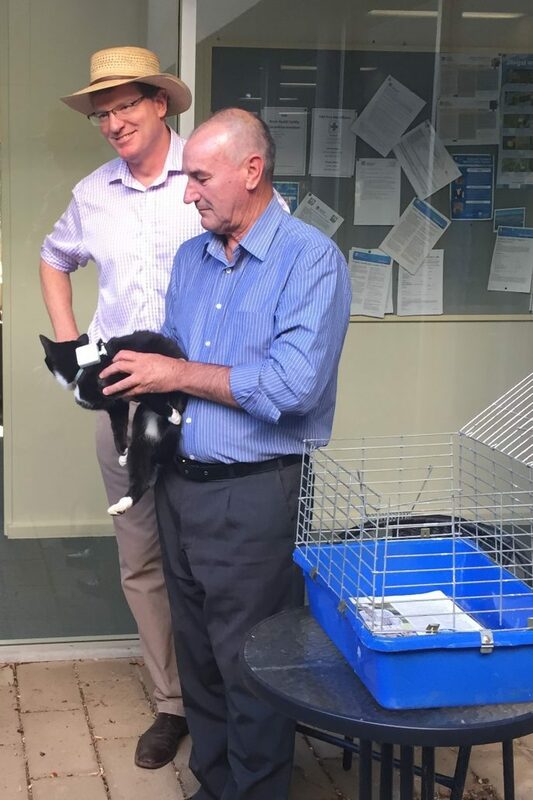 The project, which involves fitting a small, lightweight GPS tracker to cats and monitoring their movements for 11 days, has already been rolled out in Orange and Lithgow and is now coming to Mudgee. The Cat Tracker Project aims to find out where cats venture to and to promote awareness of the distances that domestic cats can travel. It will also give a better understanding of the time spent away from home and the location of the cats when they roam. Cats and their humans from Mudgee, Gulgong, Rylstone and surrounding farms and peri-urban areas are invited to join the program. The participating cats will wear a small motion-sensored GPS tracker, fitted to a harness for a maximum of 11 days. The GPS device and harness combined weigh less than 50g and the harness is fitted with a a breakaway safety buckle to prevent cat becoming caught or snagged on an object. The information collected by the GPS trackers will be downloaded and overlayed onto mapping imagery. This will be provided to the cat owner so that they can identify where their cat has travelled. You can view results from a similar project run in South Australia at: http://www.discoverycircle.org.au/projects/cat-tracker/tracks. Want to find out more about the project or how to get involved? An information and registration session will be held on Thursday 18 May at 6pm at the CWA Rooms, 48 Market St, Mudgee. For more information or to register please contact Julie Reynolds, Central Tablelands LLS Land Services Officer, on 6378 1706 or 0418 150 1676 or by email: julie.reynolds@lls.nsw.gov.au. Want to find out more about soil erosion issues, their causes and solutions? Join us on a Field Trip to local properties to look at some common cases in our region. Watershed Landcare will be hosting two days of soil workshops as part of the ‘Digging Deeper into Watershed Soils’ project, on 11 and 12 May. The workshops will be held on properties across the region, looking at issues common to the area and exploring how to implement solutions and improve the soil health on your own place. Due to popular demand, Watershed Landcare has invited Agricultural Ecologist, David Hardwick, back to our region. David has been very well received at previous workshops he has held for Watershed Landcare. An entertaining presenter, he will help land managers dig a little deeper and look below the surface at their soil issues. Lue Station will host a workshop on Thursday 11 May looking at an incised gully in a 3rd order stream. This poses a landscape scale problem with the surrounding floodplains draining quickly and becoming drier. David will explore solutions to rehydrate the landscape with participants and suggest methods on how to reduce the speed and volume of water runoff. Participants will also have an opportunity to meet members of Bingman Landcare, find out what they do and how to get involved. Two differing scenarios will be addressed at the workshop on Friday 12 May. Our morning session will visit Matt and Emma Kurtz’s property where historical contour banking has been compromised resulting in a concentration of water, with sheet and channel erosion and scalding occurring as the water moves down-slope. Then follow us out to the lovely Karrabool Olives on Botobolar Road where David Sargeant and Judy Rogers hope to reduce the runoff which is causing sheet and rill erosion through their olive grove. Here participants can get their hands dirty and learn how to construct small rock structures to slow and spread waterflow. These are catered events so just bring yourself and some protective clothing (hats, boots, rain jacket) and water. For more information visit our website: www.watershedlandcare.com.au/events and go to the May events. The field days are free to attend but places are strictly limited. To register please contact Beth Greenfield, Digging Deeper into Watershed Soils project Coordinator, on 0438 090 525 or by email: info@watershedlandcare.com.au. These events are supported by Watershed Landcare through funding from the Jaramas Foundation and Landcare Australia and are a part of the NSW Government’s Local Landcare Coordinators Initiative, supported through the partnership of Local Land Services and Landcare NSW. Legumes are desirable species in any pasture mix, not only for their stock feed value but also because of their nitrogen fixing ability. But did you know there is a diverse range of native legume species? Native legumes have the benefit of being adapted to local environmental conditions and it is thought they may be more drought tolerant than their current exotic pasture legume counterparts. But relatively little is known about these plants. Local Land Services Senior Pastures Officer, Clare Edwards, is conducting a project to learn more about native legumes and where they are found in the Central Tablelands. “Many of our native and naturalised paddocks on the Central Tablelands have native legumes as part of their composition. They play a vital role in biodiversity, as well as a legume component in our pastures for livestock.” said Ms. Edwards. “Unfortunately, we know very little about some of the native legumes such as Glycine and Desmodiums or their associated rhizobia and their potential to fix nitrogen. This study will investigate the nodulation of these native legumes and record where they are found in the landscape. Sometimes, we overlook these species even though they can play an important part in our pasture systems.” she continued. The Central Tablelands Local Land Services is looking for landholders who have native legumes in their pastures to be part of the first survey to be undertaken into such species. As part of the study, the Local Land Services will be taking plant and root samples from the paddocks, a soil test to correlate soil nutrients and an estimation of the composition of the other plants found alongside the native legumes. “The Desmodiums, often known as native tick-trefoils, and the Glycines are woody year-long green perennials. They are commonly found in our grasslands all year around, however they are more noticeable at the moment due to their flowering at this time of year.” said Ms. Edwards. “We are seeking producers who think that they may have these species in their paddocks to call in and register their interest in being part of the study.” she continued. For further information and to register your interest as part of the survey please contact Clare Edwards on 0428 435 615 or by email clare.edwards@lls.nsw.gov.au. When we think of the ecosystem services provided by trees, we often picture large stands of forest. But scattered paddock trees are also an important part of the landscape and deliver multiple benefits on healthy and productive farms. Paddock trees supply production benefits by providing shelter for stock and crops, habitat for pollinators as well as birds and bats beneficial for pest control, and improve soil structure and fertility as well as aiding in the management of salinity. Scattered paddock trees also serve an important function for native wildlife, providing a food source and nesting sites. They also act as stepping stones for animal movement between other patches of vegetation and water sources. Paddock trees on agricultural land in temperate Australia are in decline. This is not isolated to paddock trees, mature trees in larger stands of vegetation are also disappearing, but often the effects are more pronounced in isolated trees. A lot of these trees are simply dying of old age; most of the existing mature trees are old and little regeneration is occurring. However, factors such as insect damage, mistletoe infestation, wildfire, stubble and log litter burning, clearing and cultivation also contribute to dieback. Changes to soil fertility and water retention levels due to pasture improvement and the use of fertilizers and hebicides can also have an impact. The extent and severity of tree decline has reached historically high levels in the past few decades and some estimates predict that in 40 years all the paddock trees could be gone. But even these dead or dying trees have a role providing homes and shelter for wildlife, particularly mature trees with hollows which are scarce nesting sites for a number of species. The cracks and crevices in bark likewise provide habitat for invertebrates and small animals. There are a number of things you can do to help protect paddock trees and help their regeneration on your patch. Fencing around selected trees will help to protect them from stock and limit detrimental agricultural practices such as applying fertilizer in the root zone and reducing herbicide spray drift. Wire netting can also protect from ringbarking by stock and feral animals. Planting additional shade trees for stock can also take the pressure off the old giants. Installation of temporary fencing will help natural regeneration to take place; an area twice the size of the tree canopy is ideal. Managing grazing and pest herbivores such as rabbits, hares, goats and kangaroos will also give the young saplings the best chance of survival. Logs, stumps, and fallen branches are also habitat for ground-dwelling animals and allowing timber to rot on the ground benefits soil fungi, which play an important role in nutrient cycling. So refrain from burning; leave timber where it is or relocate to a more convenient remnant vegetation area or creek as wildlife habitat. Agro-ecologist, David Hardwick, will be working with local landholders to improve the soil health on their patch. 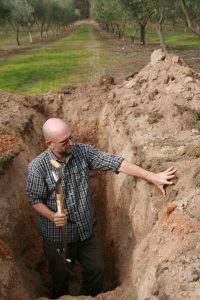 Watershed Landcare have collaborated with Mr Hardwick on a number of soil health projects in the past and have invited him back for the Digging Deeper into Watershed Soils project. The participating landholders will have their soil tested and work with Mr Hardwick to analyse the soil test results and determine management options. The landholders will have the opportunity to increase their knowledge of the aspects which impact on soil health, such as soil chemistry, soil biology and ecology, and discuss their proposed on-ground works with Mr Hardwick to find solutions which are relevant to their operation, management approach and location. Interested to see what they come up with? Watershed Landcare will be hosting a field trip to visit the participating properties in May. David Hardwick will join us on the bus trip from Mudgee to visit the 3 farms and discuss the soil test results, work conducted and how the decisions were arrived at. The discussion during the field day will also focus on soil biology, soil water, soil acidity and other soil health issues within our region more generally. For more information on the Digging Deeper into Watershed Soils project or to register your interest for the field trip contact Bethany Greenfield, Project Coordinator, on 0438 090 525 by email: info@watershedlandcare.com.au. This project is supported by Watershed Landcare through funding from Landcare Australia and the Jaramas Foundation and is a part of the NSW Government’s Local Landcare Coordinators Initiative, supported through the partnership of Local Land Services and Landcare NSW. Are you interested in learning about bees, or perhaps having your own hive but don’t know where to start? Want to improve the health of your soils? Healthy soils are the foundation for healthy pastures and, in turn, healthy livestock. But how can you improve the health of your soils? Landholders in our region will have the opportunity to explore soil health through a series of workshops and hands-on projects. As part of the ‘Digging Deeper into Watershed Soils’ project, Watershed Landcare are looking for 3 sites in our region to host workshops and conduct on-ground works on their properties focusing on soil health. The project, which is made possible through funding from Landcare Australia and the Jaramas Foundation, aims to improve landholders knowledge of aspects that influence their soil; including soil chemistry, biology, hydrology, botany as well as local knowledge. 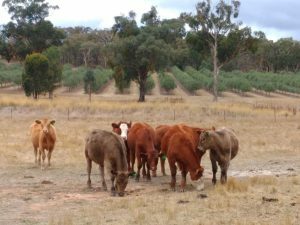 The first workshop in the series, focusing on pasture establishment and management, will feature Robert Freebairn and will be held later this month. The remaining workshops will be tailored to the individual project sites, giving the participating landholders an opportunity to work with the experts engaged to discuss their proposed on-ground works, determine the best management options and address the issues at the project site. Participating landholders will also receive a free soil test. Watershed Landcare is seeking expressions of interest (EOI) from interested landholders to host workshops on their property and receive funding to assist with on-ground works to improve soil health on the land they manage. On-ground works eligible for funding include erosion control work, works to improve hydrology, compost or compost tea applications, pasture cropping, increasing nitrogen-fixing plant composition of pasture or any other innovative and creative ideas that meet the project objectives. Individual landholders will be able to apply for up to $750 in funding and will be required to provide a 25% in-kind contribution (labour or materials) to the project. For further information contact our Coordinator, Claudia Wythes, during business hours on 0412 011 064 or email: claudia.wythes@watershedlandcare.com.au. This project is supported by Watershed Landcare through funding from Landcare Australia and the Jaramas Foundation and is part of the NSW Government’s Local Landcare Coordinators Initiative, supported through the partnership of Local Land Services and Landcare NSW. http://watershedlandcare.com.au/wp-content/uploads/2016/12/logo-watershed-300x104.png 0 0 wslc http://watershedlandcare.com.au/wp-content/uploads/2016/12/logo-watershed-300x104.png wslc2016-10-07 08:53:282017-06-27 08:55:26Want to improve the health of your soils?